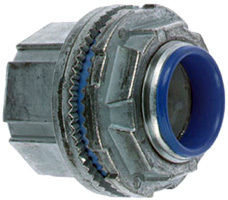 This watertight hub can be used indoors or outdoors in wet or dry locations to connect rigid conduit or IMC to a threadless opening in an enclosure. Rugged metal construction, this hub comes with an insulated throat. *used indoors or outdoors in wet or dry locations to connect rigid conduit or IMC to a threadless opening in an enclosure.